I skied with a group to near the summit of Cayoosh Mt today. 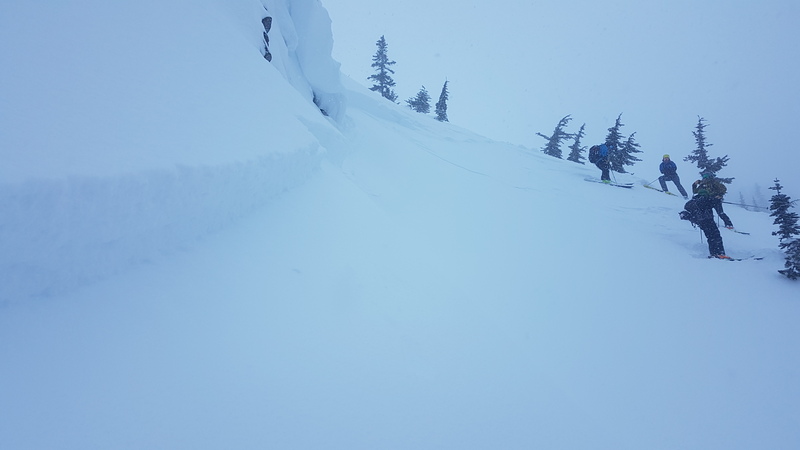 Surprisingly good snow conditions made by about 20cm new snow over the variable Jan 17th crusts, wind slabs and surface hoar. It was definitely a low visability windy day high on the mountain! On the ski down (after a regroup near the top of Tree Line on the usual line down the skiers R side of the main slide path) I ski cut a Sz 1.5 slab that stepped down into layers that where deeper than the new snow. The fracture line was about 60m long and had a maximum depth of around 40cm. I didn't have time to really assess it but it clearly stepped down and ran on older surface hoar. Probably Jan 2 or maybe Dec 26. Check out attached photo. Earlier on the way up I cut small pockets of wind slab that ran on the Jan 17 surface hoar. The character of this slide was much deeper involving stiffer lower layers. We did not see any recent natural avalanches today. The snow depth is now deep enough to cover many features from forest to moraine and glacier making very comfortable touring.